Hosting a get-together and trying to figure out what to serve? 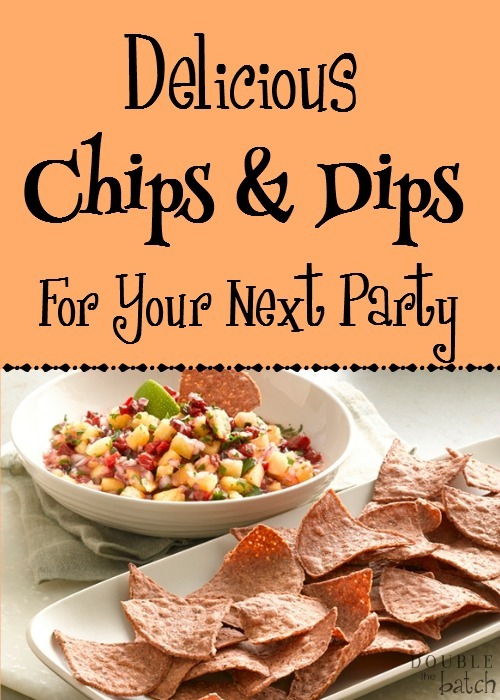 Try these delicious chips and dips for your next party and wow your guests! 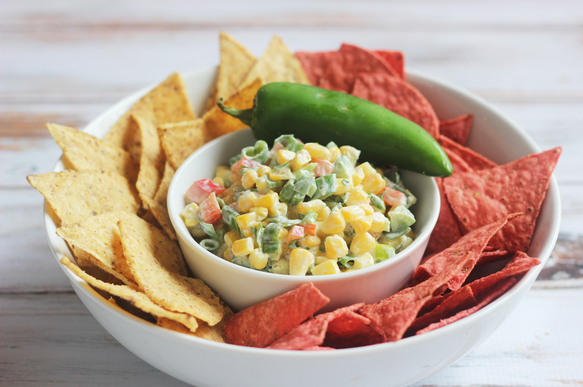 They are delicious with your favorite salsa or with this yummy Creamy Corn Jalapeno dip pictured here! Give them a try! Bring of pot of salted water to a boil. When boiling, add the corn and cook for 5 minutes. Remove the corn and let cool. Cut off the kernels from the corn and reserve for salsa. While corn is cooking, prep all other ingredients. Mix all ingredients together and adjust lime, salt and pepper to taste. 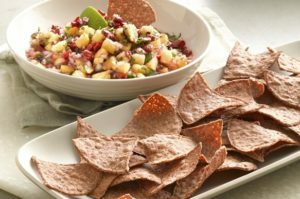 Serve with Food Should Taste Good™ Multigrain, Jalapeno, or Lime tortilla chips. Food Should Taste Good let me try a variety of some of their other chip flavors and I was impressed with every one. Like these oh, so festive Harvest Pumpkin chips! Try them with your favorite creamy cheese topped with a cranberry compote. You won’t be disappointed and neither will your guests. In a 1-quart saucepan, heat oil over medium heat. Add onion. Cook about 2 minutes or until soft. Add cranberries, brown sugar, cinnamon, and water. cook 8-10 minutes or until cranberries have started to pop. Stir in salt and vinegar; cool slightly. Place cheese on desired serving platter and pour compote over the cheese. Serve with chips. Or they are delicious with this Pineapple Chipotle Salsa! 1. In large bowl, mix all ingredients except chips. 2. Cover and refrigerate until needed; serve with Food Should Tate Good™ Harvest Pumpkin or Sweet Potato chips. 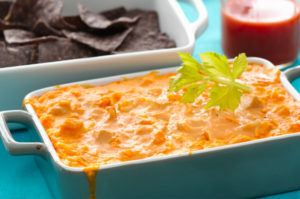 Their Blue Corn Tortilla Chips are awesome with this easy, but tasty Buffalo Chicken Dip! Preheat oven to 375°F. Season chicken breasts with salt and pepper and grill until the internal temperature is 165°F. Remove chicken from grill, let cool, dice small and add to a large mixing bowl. Add remaining ingredients. Using a rubber spatula, gently fold ingredients together until well combined. Transfer mixture to a baking dish and place in oven. Stir mixture periodically. Bake until hot all the way through, about 15 to 20 minutes. 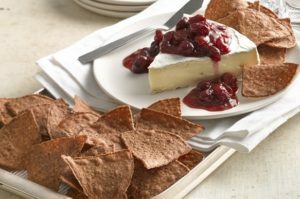 Serve with Food Should Taste Good™ Jalapeno or Blue Corn Tortilla Chips. They are also great with the Avocado Hummus Dip– who doesn’t love avocado? Place garbanzo beans, avocado and garlic in a blender or food processor. Add the olive oil a little at a time, until the hummus is well pureed. Add more olive oil, if needed, by the tablespoon to get the consistency just right. Salt to taste. 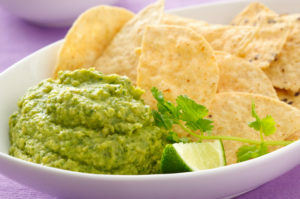 Serve with Food Should Taste Good™ Lime, Multigrain or Blue Corn Tortilla Chips. The Sweet Potato Chips were so good they didn’t last long enough to make it into a dip honestly, but they would be great with a classic Ranch dip with cottage cheese added to it for a little texture. Delish! They have gluten-free options if you need them and they are certified non-GMO. So- if you are looking for a healthy alternative to the average snack chip, look no further. These are the chips for you! These are some of my favorite dips, but they have several more ideas here for you to try. You can order them online here if you can’t find them at any of your local grocery stores.